Your winners for the 2016 Also Recognised Awards would like to say thank you. The ethos of these awards is to recognise talent for the sake of it, rather than splashing out on expensive trophies or ceremonies – which is another way of saying we have no sponsors, no money and no armies of volunteers! But, while low-key, that doesn’t mean we don’t want to make a high-profile online fuss. We asked your winners to snap “certificate selfies” of themselves and have collected those received to date and acceptance comments to date below – PLUS a rather special, mischievous video. Please share each and every one of them to your heart’s content. And, if anyone else connected with any of this year’s winning shows wants to contribute a certificate selfie, please do email us. We’d love to add you to the gallery of game Also Recognised winners below. For more on this year’s awards, see also the full voting results, news release and organiser comments. And click here for a history of the awards. Please share the results and help us spread the word about these winners and nominees by sharing the results on Facebook, Twitter and wherever else you can! On Twitter, be sure to mention @MyTheatreMates and the #AlsoRecognised Awards so we can see and retweet you. Here’s a reminder of why Peter Pan Goes Wrong won this category: the Mischief Theatre mischief-makers are as funny onscreen as it is onstage. Peter Pan Goes Wrong returns later this year to spend another Christmas in the West End, running 20 October 2016 to 29 January 2017 at the Apollo Theatre. Meanwhile, the company that first brought us The Play That Goes Wrong are – no doubt, mischievously – preparing yet another West End spoof, The Comedy About a Bank Robbery, which premieres at the Criterion Theatre on 21 April. Mischief Theatre actor, writer, producer and artistic director Henry Lewis – who also made the West End follow-up trailer for Peter Pan – took a break to take this certificate selfie … mischief style. In the same week that it scooped four gongs at the 2016 Olivier Awards, Gypsy adds to its awards haul with the key Also Recognised Award for Best Musical Direction for Nicholas Skilbeck. Nicholas pays tribute to the show’s two onstage Olivier winners, Imelda Staunton and Lara Pulver, and many other collaborators – including the full orchestra, quite rightly – in his acceptance comments. They’re all stars to the Mates. “Firstly, thank you to Terri Paddock and Mark Shenton for this generous recognition. On behalf of musical directors everywhere this is greatly appreciated. “There are so many people who I want to share this award with. To start with, my associate Tom Kelly for his flair, musicianship and knowledge, particularly in our collaboration on the new orchestrations. Gypsy was an unforgettable experience – a rare moment when the stars just seemed to happily align. “It was my privilege to stand in front of the Gypsy orchestra and conduct. Let me name these comrades one by one. They played with enormous spirit and love. Matt Skelton, Laurence Ungless, Owain Harries, Nick Briggs, Dave Hopkin, Ruth O’Reilly, Jon Stokes, Chris Traves, Rupert Widdows, Steve Pierce, Jay Craig, Mikey Davis, Carys Hughes. This is for you. Last year, the Also Recognised Awards introduced the prize for Best Musical Direction (the first in the UK, dontcha know). This year, with input from our stable Mates, we introduced this new category, which was won by Scott Alan and Cynthia Erivo for their intimate musical evening at St James Studio. American Scott Alan has released seven albums to date, including, most recently, Cynthia Erivo and Oliver Tompsett Sing Scott Alan. Best Musical Cabaret is one of two categories Cynthia featured in this year: she was also part of the four-strong cast of Songs for a New World, which was nominated for Best Ensemble Performance. Now, of course, this West End diva is reprising her acclaimed Menier Chocolate Factory performance in The Color Purple on Broadway, opposite Jennifer Hudson. Glad she was able to take a little break for this selfie! The stage version of Alan Parker’s hit 1976 film musical Bugsy Malone reopened Lyric Hammersmith in April 2015 after the theatre’s multi-million pound redevelopment. The production,helmed by artistic director Sean Holmes, marked the show’s first professional revival in ten years, performed by three casts aged 9 to 19. After an extended, sell-out season last year, it returns to Hammersmith in June. Natalie Dew made her musical debut playing the lead of football-mad Jess in the world premiere of Bend It Like Beckham, having racked up play credits including Juliet in Romeo and Juliet. She was also Olivier nominated for Best Actress in a Musical for the role. She was kind enough to send us two certificate selfies and we couldn’t choose – so decided to show her scoring twice. Seems apt. Not just for politicos: the Donmar Warehouse was almost a shoo-in for this category with this ground-breaking, once-in-a-lifetime events. And not just a theatrical event: a first for both theatre and television. James Graham’s play The Vote was set in a fictional polling station and broadcast live from the Donmar on the night of the General Election, timed to finish exactly at the moment that the real poll stations closed and the first exit poll results were announced. Artistic director Josie Rourke directed the all-star ensemble, which include Mark Gatiss, Catherine Tate, Nina Sosanya, Judi Dench, Timothy West and many others. For its live TV achievement, The Vote has also recently been nominated for a BAFTA. For a second year in a row, this category is won by a Cameron Mackintosh production. Last year, it was the West End’s longest-running musical Les Miserables; this year, its second longest-running, The Phantom of the Opera. And, as we learned when we contacted Cameron’s office about this win, it’s the same digital nous behind both: social media manager Jon Kennedy. Like @lesmisofficial, @PhantomOpera generates a daily stream of engaging content, with behind-the-scenes insights, top cast involvement and fan fun. The phans also helped propel Phantom into pole position for this year’ Magic Radio Audience Award at the Oliviers! Jon tells us he has his 2015 Also Recognised certificate framed and hung on his wall at home. We hope there’s room for this second one. And next year…? Recent Twitter takeover star Emmi Christensson, who plays Christine Daae in The Phantom of the Opera, gathered the rest of the cast together for this mass certificate selfie to say well done to their social media leader Jo and thank you to the voters. 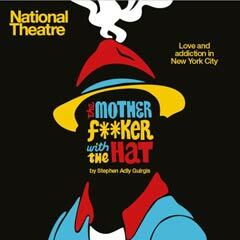 Another stroke of marketing flair, the winning Show Poster for the UK premiere of Stephen Adly Guirgis’ New York set play The Motherf**ker with the Hat, was also a team effort: with design and illustration created in-house by the National Theatre’s Graphic Design Studio, which is headed by creative director Ollie Winser.